Stems: Erect, simple or branching above, often purplish, glabrous and waxy below, appressed-hairy in inflorescence. Leaves: Mostly alternate, simple, stalked, lanceolate, 4 to 12 inches long, 1 to 4 inches wide, rough above, soft-hairy below; margins sharply toothed to occasionally nearly entire; tips pointed. Inflorescences: Heads, numerous, in loose, panicle-like clusters; heads 3 to 4 inches wide; bracts linear-lanceolate, slightly longer than disk, overlapping, loose and spreading. Flowers: Ray florets 10-20, about 1.5 inch long, yellow; disk florets numerous, golden-yellow. Fruits: Achenes, short, flattened, dark brown to black, tipped with 2 awns, enclosing small seed. Habitat: Stream and wetland edges, open bottomlands, damp prairies, roadsides, and waste places. 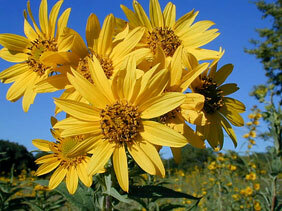 Forage Value: Livestock will consume sawtooth sunflower. Uses: Native Americans treated burns with a poultice made from the flowers. Comments: Named for the conspicuous teeth along the leaf edges.